Beginning his professional voice-over career in 1979 as an on-air radio personality, audio production specialist and freelance male voice talent, Eric Lee is the engaging voice of thousands of radio and television commercials, hundreds of video narrations, eLearning courses, on-hold messages, audiobooks, explainer videos, and more. His versatile, warm voice captures your audience’s attention and delivers your message clearly, confidently and effectively, be it a conversational read, crazy character voice or accent, or any style you can imagine. Small, medium, and Fortune 500 companies rely on Eric Lee to deliver their message. You can, too! 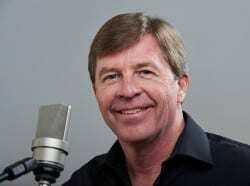 Eric Lee serves voiceover clients worldwide via Source Connect and ipDTL.